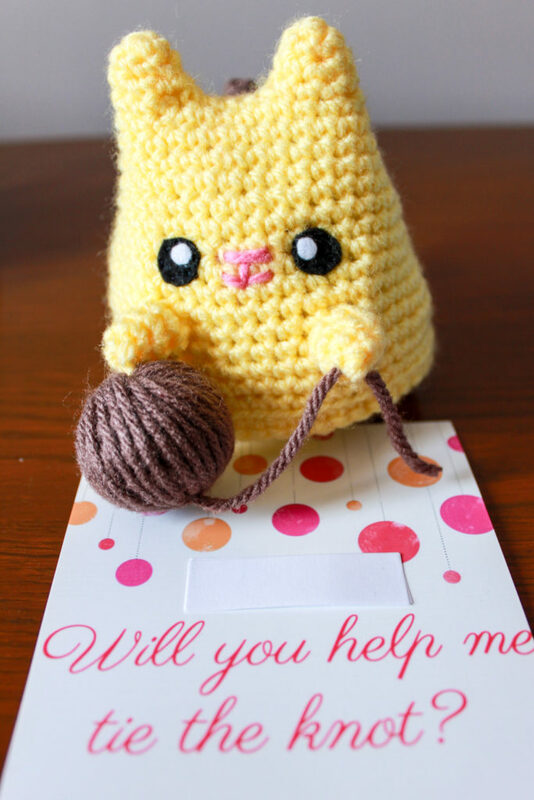 Crochet Your Own DIY Bridesmaid Proposals! So I have some big news: I’m engaged! On a perfect summer evening with the sun setting by the river, the man of my dreams popped the big question. Obviously, I said yes! Since then, it’s been a busy whirlwind of planning, decisions, and ironing out logistical details– one thing at a time. One of the first tasks I had to cross off the wedding-planning checklist was: choosing a bridal party. 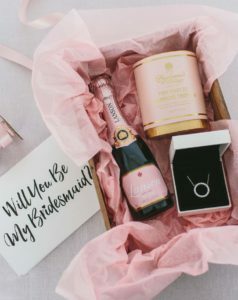 I started my online search for ‘diy custom bridesmaid proposals’ or ‘personalized will you be my bridesmaid gifts ’ and came across many examples of diy bridesmaid boxes stuffed with champagne, jewelry, and pink tissue paper. 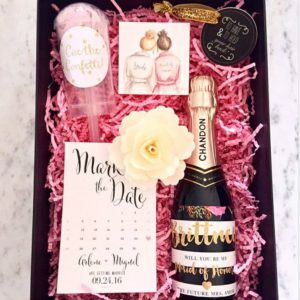 These were all very beautiful examples, but I wanted to find a way to make my bridesmaid requests more personalized. A few of my requests were going to men, so I wanted to stray away from things that are particularly feminine. I was also planning to ask 6 people to be in my wedding party (and planning for a wedding of over 200 guests) so I was looking for a more affordable option than buying 6 bottles of good wine or champagne -especially this early on before the real wedding spending had even begun! 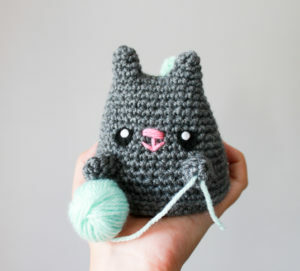 Enter my long-time hobby of crocheting. 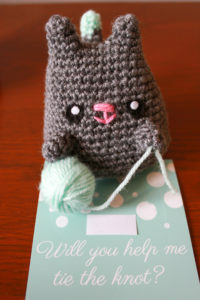 A crochet bridesmaid proposal is a diy option that is personalized, inexpensive, and unique. 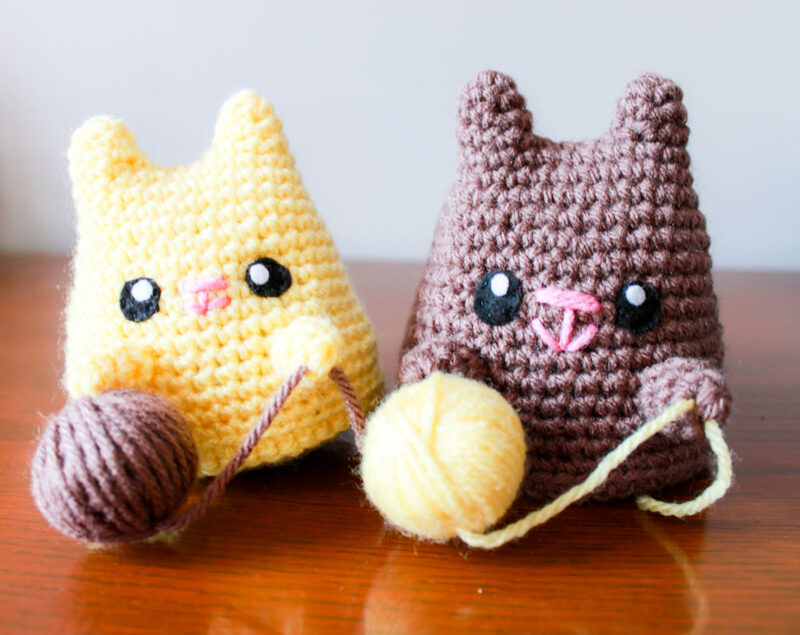 I searched the internet high and low for any examples of ‘crochet bridesmaid requests’ – but I really couldn’t find anything specific. 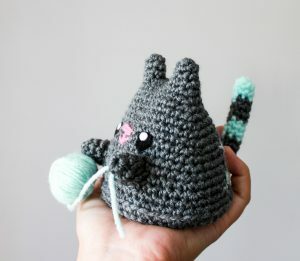 I decided instead I would find a free crochet pattern of something cute and create a custom card inviting my friends to “help me tie the knot.” I ended choosing this free Dumpling Kitty Design by critterbeans -available on Ravelry . Voila! 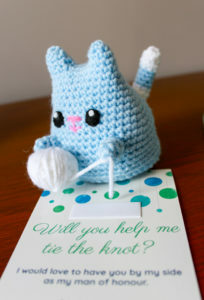 Each friend got a dumpling kitty, personalized letter, and a ‘Will You Help Me Tie the Knot?‘ card. The cards were printed on photopaper and modified from this template– which is a free, customizable (text and color!) party invitation from Greetings Island. I love how they turned out and I’m SO pleased to say they were all successful- everyone I asked said yes! 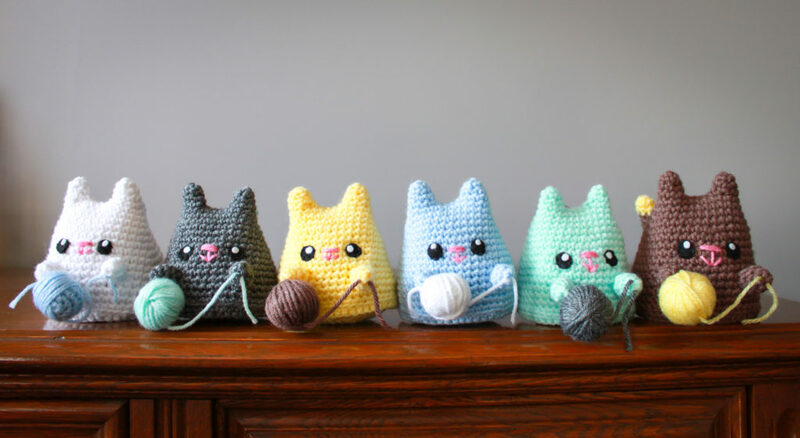 I hope these little dumpling kittys can give you some inspiration for your own bridesmaid request cards! 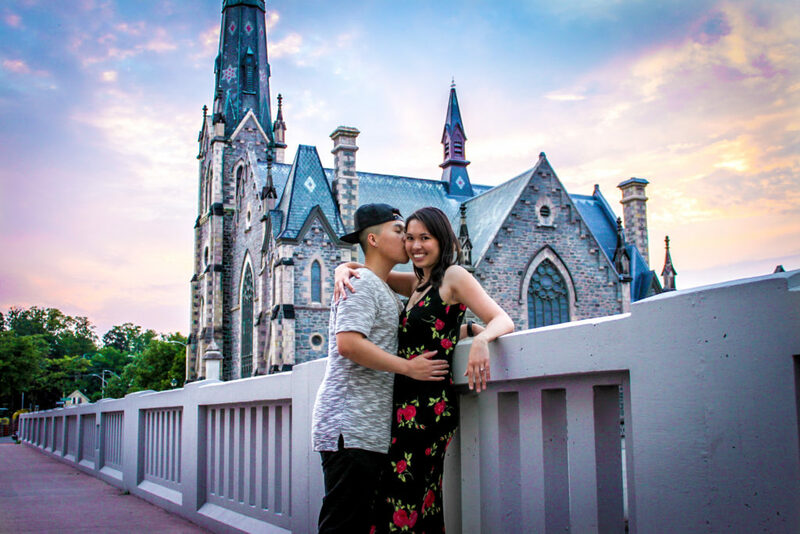 I can’t wait for our big day- I’ll keep you posted if I use diy crochet in any other aspect of the wedding planning. 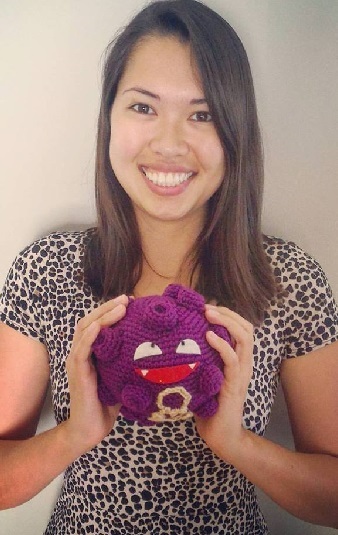 Leave me a comment if you’ve crocheted anything wedding or party related! I’m always looking for new ideas.